For friends, family, and large groups traveling with a destination in mind, traveling by motor coach in the Greenville/Spartanburg area is a smart choice. Sitting back and relaxing in the comfort of a modern-day motor coach is an excellent way to discover new places and take in the surroundings. If you are planning a trip soon, don’t overlook the advantages of traveling by motor coach as opposed to car or airplane. When traveling in groups via a motor coach, you are using less fossil fuels per person than utilizing cars. In fact, charter buses get 5x better gas mileage per person than average cars. With a vehicle that holds 56 passengers, that is far more beneficial to the environment than using cars. With less accidents and injuries than any other form of travel, motor coaches are incredibly safe. At Atchison Transportation Services, all our drivers undergo extensive training to ensure that safety is always our top priority. Every driver participates in ongoing training programs and takes pride in carefully following the best precautions while driving on the road. Traveling via a motor coach is an economical solution that can save you money, while still being a luxurious experience. The cost per person traveling ends up being much less expensive than other alternatives including driving yourself when you factor in gas, tolls, and wear on your vehicle. Motor coach rates are quite competitive when you look into it. Instead of focusing on the road, sitting back in a coach bus can be a fun way to socialize and enjoy the views. Additionally, modern-day vehicles now come equipped with WiFi connections, USB ports and electric outlets at every seat so you can always be comfortable and connected. As a premier motor coach company in the Greenville/Spartanburg area, Atchison Transportation Services has been proudly meeting the needs of our community for over 65 years. All our premier motor coaches undergo the highest inspection checks on a regular basis, and our drivers are highly-trained professionals who take pride in their work. 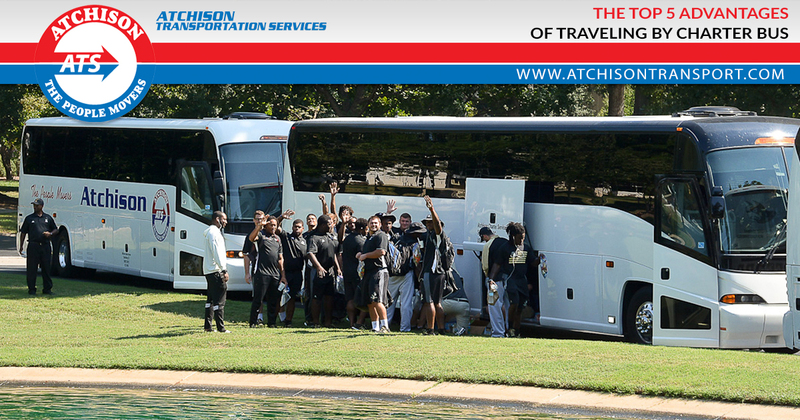 For your next group trip, contact Atchison Transportation today at 1-800-346-7129.